In architectural geometry over the last few decades, a common topic of research has been how to build and clad doubly curved surfaces in an efficient way. While computer aided manufacturing has made it possible to make buildings where every panel has slightly different dimensions, there are still often significant benefits in fabrication and assembly if identical panels can be used. However, it is a geometric impossibility to smoothly cover a doubly curved surface with many perfectly identical panels, all meeting exactly edge-to-edge. The typical way of dealing with this is to have many variations in the shapes of the panels. 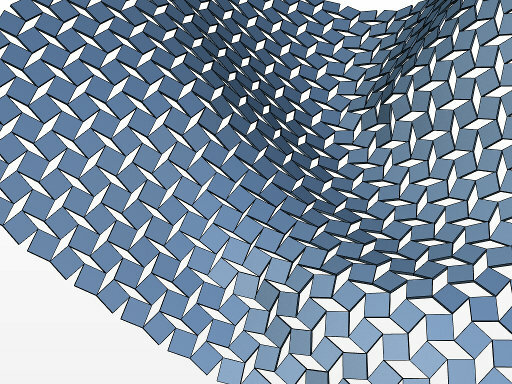 Non-uniformity in the connectivity of the mesh (ie. some irregular vertices) can help reduce the magnitude of these variations (see my previous post for more on this), but still leaves many different panel shapes. An approach I’ve been exploring a bit recently is to allow some gaps to open up between panels in a controlled way, but still keeping vertices connected. By each panel rotating slightly in a particular alternating clockwise/counter-clockwise pattern they are able to expand and contract to allow for the curvature of the surface. 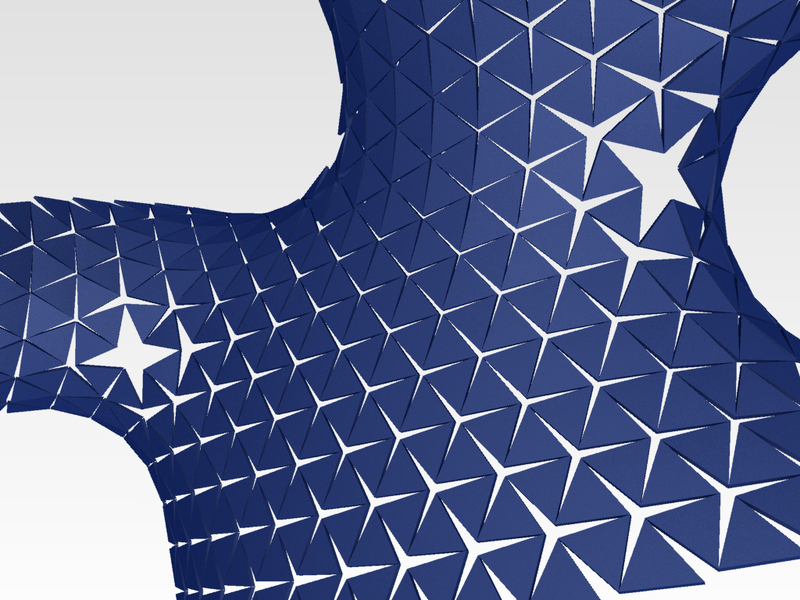 To keep a high ratio of panel to gap area, this expansion must be limited, and well positioned irregular vertices (the 4 pointed stars in the image above) can help with this. This can be done with various tiling types – squares, triangles, and hexagon/triangle combinations. However, to allow this alternating twist pattern, it must be one which can be coloured in a checkerboard fashion, which also means every internal vertex must be surrounded by an even number of faces. Of course, if we want to make such a structure into a closed skin, then something needs to fill in the gaps, which do all vary in shape, but if these are made from a material which is easier to cut, I think there could still be a significant overall benefit. For example, mass-produced identical triangular or square glass panels, with varying aluminium ‘stars’ or ‘diamonds’ for the gaps. Designing such panelizations is a good application of a computational physics design tool like Kangaroo. 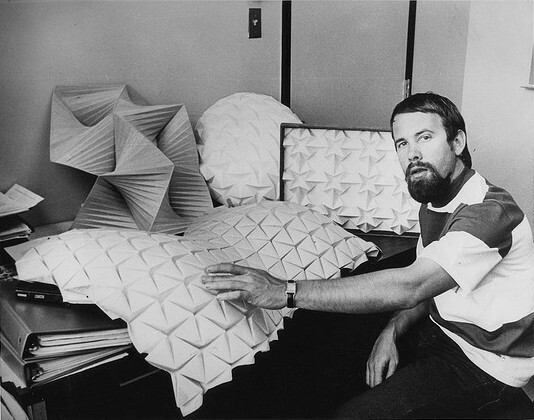 Indeed I was inspired by the sculptures of Ron Resch, who produced some similar forms as an emergent result of physical processes of folding paper. A more recent inspiration is Haresh Lalvani who has produced some related forms, by cutting thin slits in sheet steel, allowing it to twist and expand in a similar way when deformed. It is not always easy to predict what surfaces it is possible to panel in such a way, and only by setting up the physical constraints and manipulating the surface do we see how it can deform and get a feel for its possibilities. At a small scale we can actually do this with the real material, but at a larger scale, if we wanted to pre-calculate the shape and the dimensions of the varying gap pieces beforehand then the digital-physical form-finding is vital.